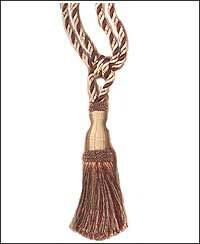 acetate and cotton single tassel tieback with an 8 1/2" tassel and a 31" spread from our Princess Mingled Collection. This item has been discontinued. ON SALE NOW FOR $10.00 EACH!! Click on the color chart at the bottom of the page to see the colors. If you are looking for a mingled color we don't have in stock, let us know, we may be able to get them for you. Sold in quantities of 6 only if we have to order it.